Despite appearances to the contrary, however, we really do eat vegetables on the regular. I suppose you know that already though, after all of my excitement over our weekly CSA boxes. Our own garden is proving to be quite prolific as well, so we are getting creative and definitely eating our daily vegetables. We planted a few little cucumber plants this year and I thought for sure we got them in too late and they wouldn't do anything. Boy was I wrong! My husband gave them some metal netting to climb and they formed a solid wall of cucumber plant. So we have been eating our weight in sour cream and dill cucumbers, gone in a second cucumbers and the like. We also have been giving them to anyone who will take some. Luckily our CSA folks have been great and let us trade the cucumbers in the box for other items, like more sweet corn! So I thought it would be fun to make a salad with that extra corn, some of the mountain of cucumbers and a few of the also prolific (and super tall) cherry tomatoes I told you about. You'll have to check out the picture I shared along with the Parmesan roasted zucchini and tomato recipe. We enjoyed this as a side dish a few days in a row with no complaint. I also think you could make a great lunch out of it by stirring in some chickpeas, feta or some chunks of grilled chicken. Oooh, or all three would make an amazing light summer meal! I hope you have been enjoying all of the garden and farmer's market inspired recipes this week. Be sure to check out the recipes my friends are sharing below as well. Happy harvesting! This salad is great leftover. It will keep in the refrigerator for several days. The basil will wilt and get darker as time goes on, but it will still taste delicious. If you don't have fresh corn on the cob, frozen can be subbed. Just parcook it a bit and then toss it with the other ingredients. Cook corn on the cob and allow to cool for a bit. Cut corn kernels off the cob. Dice onion, halve cherry tomatoes and slice cucumber. In a mixing bowl, stir together the vinegar, oil, salt and pepper. Toss in the vegetables. Refrigerate for at least an hour. Before serving, chiffonade the basil and toss into salad. It would make a perfect dinner with a few chunks of chicken thrown in! I need to make another batch! What a beautiful, colorful salad. I am drooling over all the colors in this dish. And I know I can get everything at the market this weekend. Going on the menu. It definitely should, I hope you love it! What a fabulous combination of fresh summer veggies! 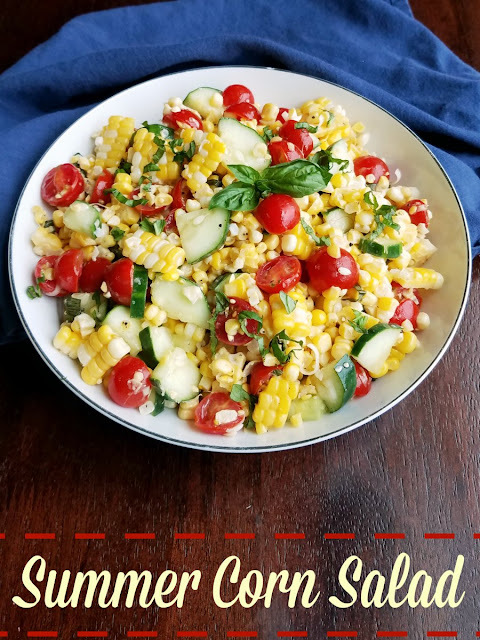 I love corn and this is a wonderful side salad or light lunch. 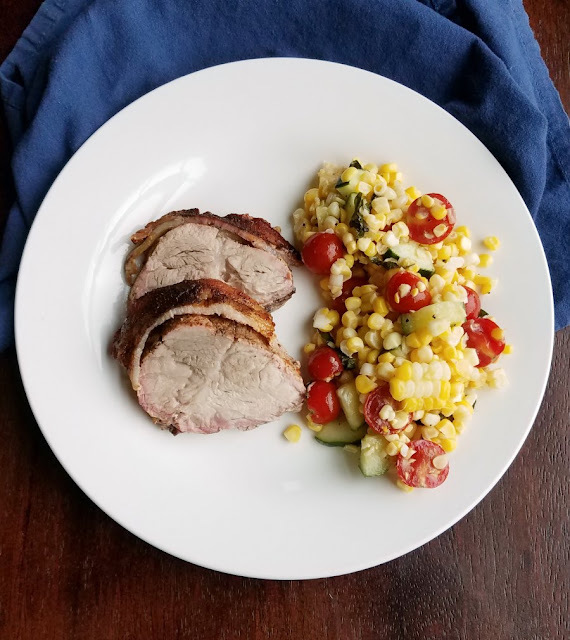 Such a wonderful way to use my garden veggies along with summer corn. That's awesome that your CSA lets you trade. I love dishes that are beautiful and tasty too! We are very thankful as we picked 30 pounds of cucumbers out of our own garden today alone! I love her w colorful this is and full of summer flavors. What a beautiful, colorful, tasty dish! Love it! I love corn salads, this look like one I'm going to be making real soon! This salad really is summer in a bowl. I hope I get a chance to make it before summer finishes! I wish I lived closer to take some of those cucumbers off your hands! The salad looks delicious and such a great summer side. We would love to share! After picking 30 pounds in one day alone, there are already another dozen or so ready to be eaten! 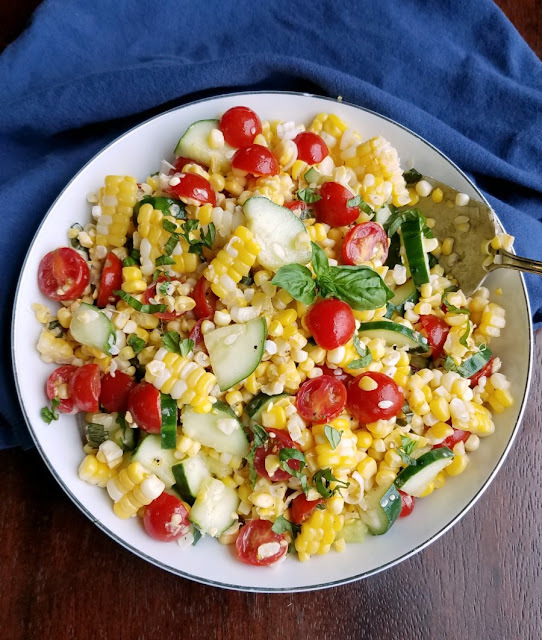 This summer corn salad looks sooo good. I love veggies. 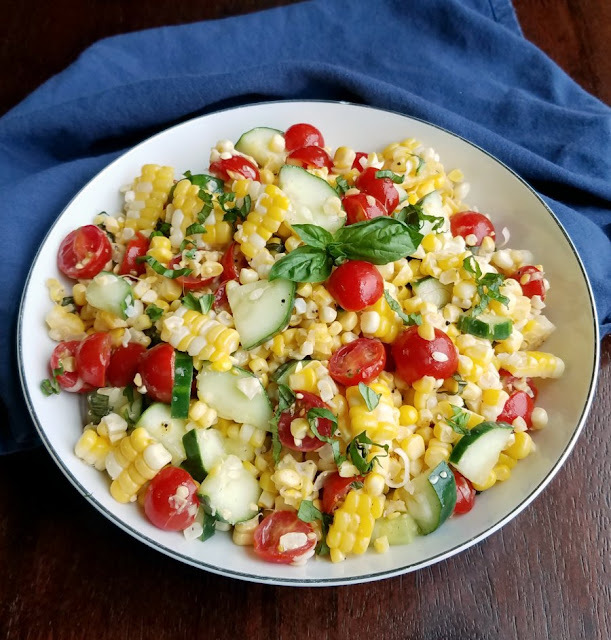 Your Summer Corn Salad will be fantastic! Hope you are having a great day and thanks so much for sharing your post with us at Full Plate Thursday! That salad is gorgeous, Carlee! I'm so jealous of all of your fresh produce. Everything looks so tasty! Thanks so much for sharing this at the Whimsical Wednesdays Link Party! We have really been enjoying the bounty this summer and since it's all local it's picked ripe and ready and oh so good!